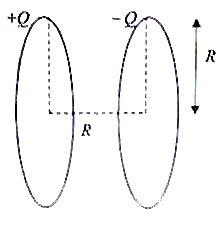 Two identical thin rings of radius R are arranged coaxially with a separation R. A charge +Q is sprayed uniformly on one ring while a charge –Q is sprayed uniformly on the other. Try to answer the above questions. I will be back soon with model answers for your benefit.